At Schwartz Laser Eye Center, we believe you are entitled to a choice in your intraocular lenses (IOLs). Everyone has a unique case and specific visual requirements, and we work hard to match each patient to the appropriate IOL. One of our most popular IOLs is Alcon’s AcrySof IQ ReSTOR, a multifocal lens that restores clear vision at near, intermediate and far distances. Since its inception, ReSTOR has made quite a difference in recipients’ lives — studies show that four out of five people with ReSTOR in both eyes reported never wearing glasses. The AcrySof IQ ReSTOR portfolio of lenses was developed for the treatment of cataracts and the correction of presbyopia. Presbyopia is a condition in which the eye’s naturally flexible lens becomes more rigid with age and unable to bend to bring close objects into clear focus. With the ReSTOR lenses, you can enjoy sharper vision at a broad range of distances. ReSTOR lenses have an “apodized diffractive” design, which means light is allocated between multiple focal points, depending on the amount of natural light available. This unique feature enhances image quality in all lighting conditions. A good example is driving at night: in a condition with minimal natural light, more light is distributed to the portion of the lens required for clear distance vision. This helps a driver see the road ahead clearly, even though it is dark out. On the other hand, in a low light condition, near vision may not be as sharp (but still workable). Another notable feature of the ReSTOR lenses is aspheric optics, which reduce a higher-order aberration called spherical aberration. Thanks to this feature, ReSTOR recipients have fewer visual disturbances including halos around lights at night. 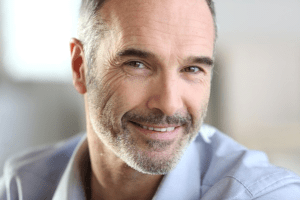 Though the overwhelming majority of people with ReSTOR lenses report never wearing glasses, some do need to wear glasses to achieve optimal vision. However, it should be noted that ReSTOR recipients are no longer dependent on these visual aids to see clearly. 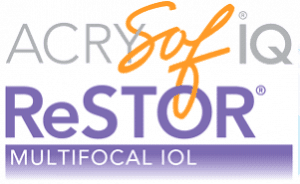 How Are ReSTOR IOLs Placed? ReSTOR multifocal lenses are easily placed at the time of cataract surgery. One eye may be treated at a time; the second eye is usually treated as the first has mostly recovered from surgery. The lens material is soft and pliable for optimal comfort. During the cataract surgery procedure, a small incision is made to access the eye’s cloudy lens. Ultrasound energy breaks up the lens into small pieces, which are gently removed from the eye. The folded-up ReSTOR lens is carefully inserted through the incision and positioned over the pupil. Finally, the incision is closed with small dissolvable sutures. Healing generally happens quickly and complications are rare. Patients notice a rapid improvement in their visual acuity and focusing power, with results continuing to improve over the course of a few weeks. If you are facing cataract surgery and want to discuss your IOL options with Dr. Schwartz and our team, please request a consultation. You can reach us by calling 480-483-EYES (3937) or 888-553-EYES, or by emailing us today.